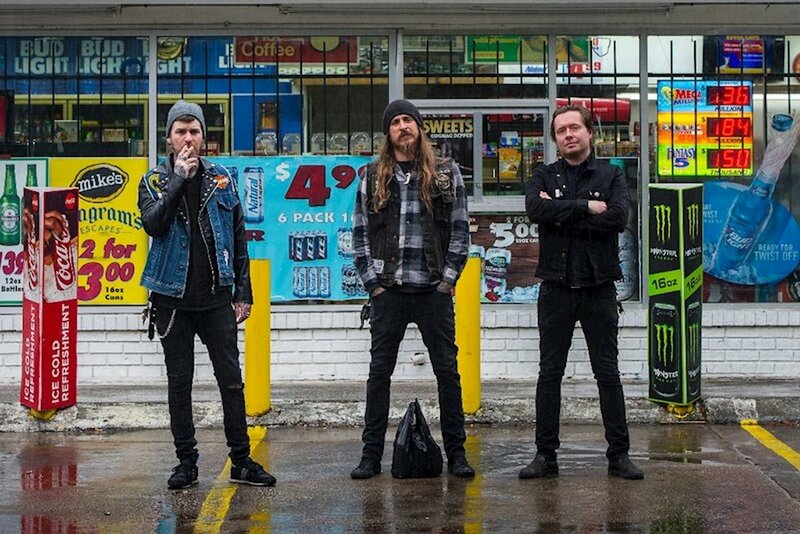 Savannah sludgesters Black Tusk recently released their fifth full-length album, T.C.B.T. Guitarist/vocalist Andrew Fidler gives us the scoop on the album, touring, the music industry and other topics. Chad Bowar: How did the songwriting process for T.C.B.T. compare to previous albums? Andrew Fidler: It was exactly the same. Black Tusk has built on the concept that every member has an equal voice and all songs are written together to make our music unique to the band, not the musical stylings of one member. After working with Joel Grind on the last album, what led you to assume many of the production duties yourselves for this one? Life, budget, geography, the desire to do it ourselves. The recording industry has certainly changed in the decade plus that we have been a band, so it’s somewhat easier to do things yourself now than opposed to when we first started. Our friends have built a top notch studio here, and our good friend and longtime collaborator Chris Adams had just moved back to town and he’s an ace engineer, so we set out to make this record at home. Corey and I also have families with small children, so being home as opposed to be being gone for 3-4 weeks, possibly longer, was extremely helpful. It also helped us to take our time with the session. We spaced it out so that nothing was rushed and ears didn’t get burned out. Sitting back and listening to the final mix and thinking what a good record we just made. There wasn’t any pressure on this album, the session went smoothly, it was a good experience overall. The band’s sound has always been changing. Whenever we write a new record, we make sure it doesn’t sound like the last record but it sounds like a Black Tusk record. I feel like this record is more a throwback to our early punk days. Its the first record with Corey’s fingerprints on it as well, and his stylings are present in the songwriting and in the use of keyboards and synths. This record is fast punk record that’s still got that Black Tusk feel to it. What inspired your lyrics for T.C.B.T.? Just like with every record, the lyrics are inspired by a combination of things that are going on in our personal lives, experiences that we have had, observations that we have made, an attitude created by the political or social climate of our country and a overall view of darkness in mankind and a futility in running the rat race. But at the same time, we do juxtapose all of this negativity that we are surrounded by with a ray of hope here and story of positive struggle or a rebirth of spirit or energy. Not really. We just listened to the songs when they were done and used the samples and keys to tie some of them together and figured out the best way to run the songs together. Not that difficult. T.C.B.T. has long been part of the band’s lexicon. What led you to use it as the album title? Yeah, its something that we have been using for a while now. It has adorned merch items and is stenciled on our road worn gear. The cover is actually a photograph of one the stencils on a head case. As you know, T.C.B.T. stands for Taking Care of Black Tusk. It’s an homage of sorts to Elvis’ TCB moniker. When we set out to do this record, we wanted something that represented Black Tusk returning to our roots. This album is a reboot in a way, new label new members, us taking care of ourselves. How did you come to sign with Season Of Mist? We had reached the end of our agreement with Relapse, and we went separate ways. Gordon Conrad is running the U.S. part of SOM now, and he is the one who initially brought us to Relapse, and he approached us about Season when he found out our Relapse deal was done. Gordon is great, he knows how to push our band and is super easy for us to work with! So far, so good. The model of the record label has changed dramatically from when we started. The downloading thing was in its infancy and nobody knew how to profit from it yet, CDs were king, vinyl not so much. Now it’s all digital, who cares about CDs, tapes and vinyl are making comebacks. Marketing and promo have changed, print magazines are dead. The labels used to help us out with booking and tour support and posters and all kind of stuff. That’s mostly gone now. They print our records, get them to the distributors, and help with the promo. We do the rest. Luckily there are still some cool labels like SOM that are still around that will help us make records. When planning a tour cycle for an album, do you have a rough road map when it comes to opening vs headlining, countries, festivals, etc., or is it completely dependent on the offers that come in? What we do is pick out regions of the world the we would like to tour and then make a loose time frame for when we want to do them. Then we give that information to our manager and booking agents and they make routings and plans based on offers that come in. We certainly suggest festivals, cities, etc. when offers and routings start coming in. We have been fortunate enough to play extensively in the US, Canada, European and Scandinavian countries, and we’ve been to Australia and New Zealand and Mexico. Still on my list of places that I’d like to play are Hawaii and Alaska, South America, Iceland and Japan! What’s the coolest site/attraction you’ve been able to see while on tour? I don’t know if there’s any one specific thing that’s been the “coolest” thing I’ve seen on tour. Contrary to popular belief tour is not just a vacation! (laughs) It’s a pretty awesome job, don’t get me wrong, but it has its limitations also. When you do van tours, the majority of your time is spent driving, or trying to catch some sleep before you have to wake up and drive again. So that being said, I’ve gotten to see the majority of two continents from a van window and that is pretty beautiful and amazing. And of course we’ve gotten to see a fair amount of your tourist attraction spots along the way, and hopefully we can find time to see some more. There’s more to see than the inside of bars and venues, and I encourage everyone to get out there and check it out. The promotion process for an album in these days of social media has become longer and much more public. Do you miss the days when there was more mystique to album releases? The industry business model is quickly moving toward renting music (Spotify, Apple Music, etc.) and away from owning it (CDs, MP3s, vinyl). Do you see metal fans being more likely to still want physical product than fans of other genres? I dunno man, there are merits of internet streaming. I liken it to the days of terrestrial radio, but instead of relying on a DJ to play stuff you like, we rely on an algorithm to do it. However, its a great way to discover new music. I’ve got a 3 year old son, so I’m definitely ignoring my record collection these days. I haven’t got the time to sit and listen and make mix tapes like I could when I was younger, so the streaming is great for me, it’s great for touring. Now hopefully someone will figure out a way for the artists to actually get paid for the streams! I do agree that metal fans are more apt to purchase vinyl than fans of another genre. We don’t make much off music sales these days, the only way for a band our level to make money really is selling t-shirts and touring. But we will continue to make physical copies of our music, because there is something gratifying about putting a copy of something we’ve worked and sacrificed for into someones hands and making their day!